I have a pathological need like to argue. It’s something that I was apparently born with, as my mother insists at a very young age I was quite obviously cut out to be a lawyer. Despite my best efforts at self-monitoring and awareness of this trait, I often relapse into base level arguments when unprepared for a conversation that may challenge my viewpoints. Perhaps that’s why I was drawn to create the image above for the ds106 Big Caption assignment. While some may question the taste of the piece (it certainly doesn’t reflect my own personal beliefs), I wanted to create something that could be used as a way to provide a contrasting viewpoint, rather rational or not, to a topic of interest that students and teachers wrestle with. In this case, I found an image from Boston.com’s Big Picture photo journalism project, an amazing look at news from around the world through striking imagery. 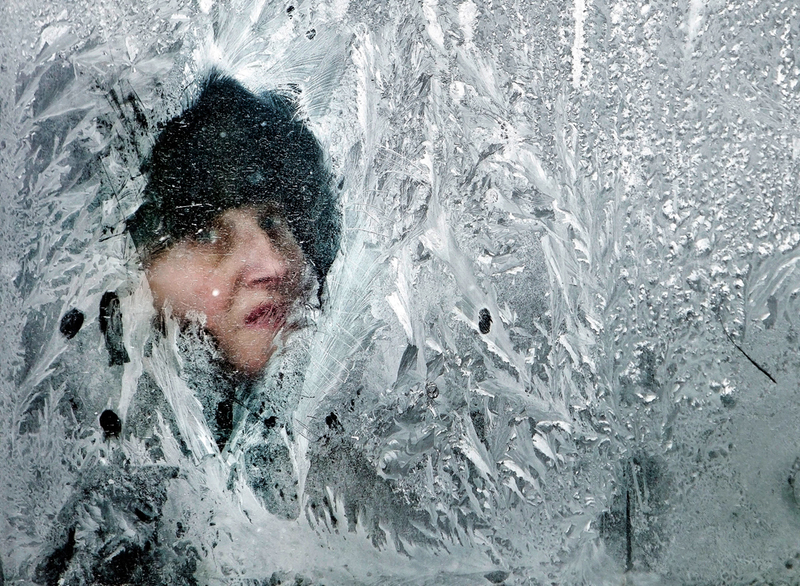 You can see the original image of a woman looking out through the ice-covered window of a bus in Bucharest below. I took the image into Photoshop and added the text, applied some simple effects (stroke and color fill), and viola! The end result is meant to be slightly tongue-in-cheek, but the idea is to try and provide a conversation piece that might provide a contrast to a topic you’re covering in class, or perhaps just practice rhetorical skills. Don’t get me wrong here, I’m not in favor of global warming, but quite often the more important discussion of how global warming will affect the lives of everyone on this planet is overshadowed by the much more mundane argument of whether it actually exists. That doesn’t sit right with me, as while I am capable of arguing over almost anything, I’d like to think that I’m discussing a topic that will lead to answers and results with greater value for everyone. 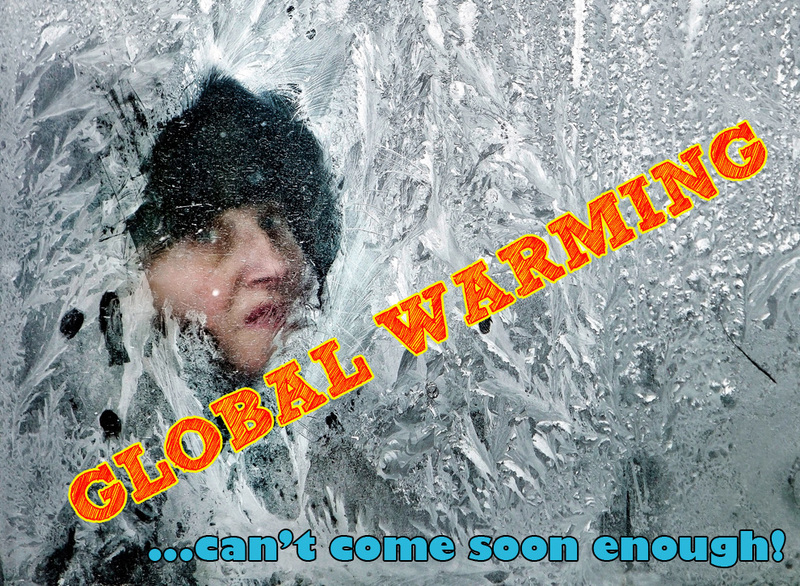 Disproving global warming isn’t going to help anyone if it still happens, but talking about how cultures, countries, and citizens might have to change their long term living patterns seems as though it might be a bit more important. I love the Big Picture site that this ds106 assignment is based upon, and the idea of captioning a striking image with a humorous, insightful, or challenging viewpoint was made popular by the Big Caption website (warning: not all images and captions are appropriate for the K-12 setting). Forgetting the captions for a moment, there is a near constant flow of amazing images from around the world on the Big Picture site that could be used for classrooms talking about current events, or want a way to bring the world into their classroom in a very humbling manner (see the rest of the images from the European winter which has many homeless living in underground heating vents). Imagery, especially such vivid photographs as those taken from around the world by professional photo journalists, can play a very intimate and important role in spurring discussion, or illustrating a point. I highly recommend any social studies or language arts teachers to give the site a look, and see what you could take from it for use in your classroom. Man, I love the idea of framing the Big Caption assignment as a means to spark controversy or debate. Brilliant, I love the approach to challenging some of our assumptions, but more than that your caption for this particular image is nothing short of brilliant. Awesome stuff. Validation like that is both awesome and scary. At times, I write this stuff up feeling as though I’m grasping at fibers of the end of a rope that are quickly running through my hand, and I’m about to lose my grip. It’s great to know that the ideas I’m trying to grab and tie down have some validity. On the other hand, having this kind of validation means that I run the risk of getting lost in another semester of ds106, which isn’t always a bad thing. This is amazing. I love the fonts you chose, and the colors as well. Thanks! I was debating the colors for awhile, and thought about reversing the blue and the red, but in the end I went with the typical warmer colors for the “warm” effect. Maybe an interesting twist assignment on this would be to use the same image to make opposing statements? I love that idea, Alan! Would be awesome to have the visuals from the Big Picture as a way to refocus on the human element if the conversation strays too much as well! I think I might ask a few of my high school social studies teachers if they might be interested in having me create some for them, give me a good task to wrap my brain around. Thank you for a thought inspiring post. As a world languages teacher, I frequently have created slide shows of colorful and often humorous images to teach vocabulary and verbal functions. I have found this to be an extremely effective method for engaging students and attaching meaning to words without having to use English. Your bold images with captions put a different twist on this method, inspiring student discourse with a provocative caption. Brilliant! I have always used Powerpoint and Keynote to create my pics with captions, but I recently discovered Picsay: http://www.picsaypro.com/ One can edit photos and add captions on their smart phones and download them to their computers. I will try this out, but I wonder what other editors there are out there that would be easy to use with a Mac. I, too, love to argue. As I read your post, I wondered why I have not thought to provoke debate in my lessons. One of my goals as an educator is to teach students to express their opinions in the target language. I teach beginning levels of French and Spanish, so my students operate with very limited vocabulary, but how many words does one need to argue? Using this technique could inspire my students to seek more vocabulary just so they could expound upon their side of the argument. They are in middle school, after all. This would be an interesting activity with your students, especially creating them in different languages, and trying to produce the same effect when the words don’t have the exact same meaning or definition, especially from a cultural standpoint. It be be a great challenge for them to reproduce the same image in English and their other language while still being sensitive to the culture and the language. If you have an iPad Haiku Deck is a nice way to use images and short captions. Royalty free images too.